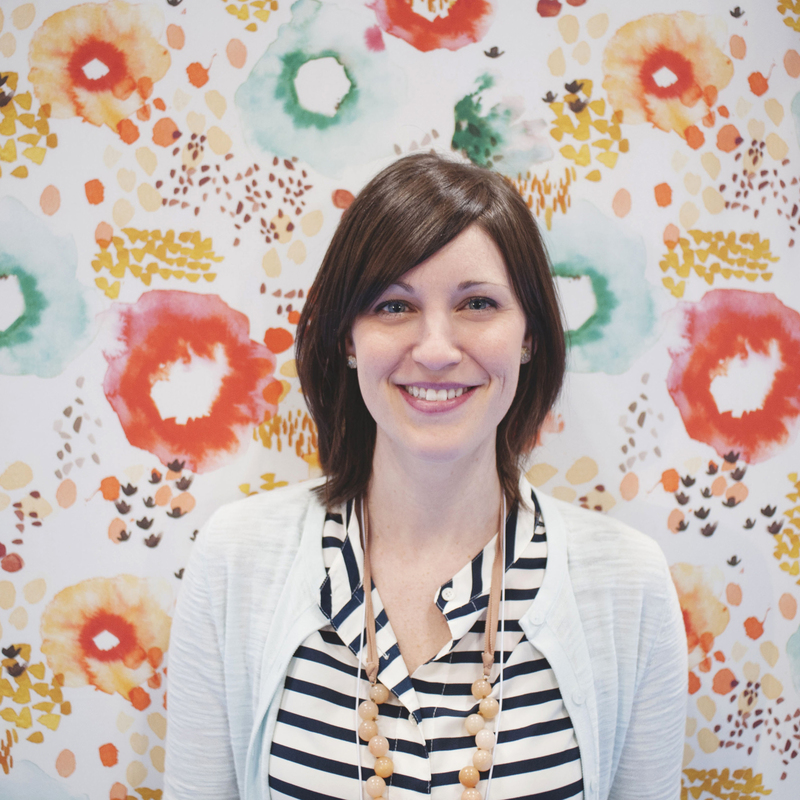 Today we interview the designer of the Flora collection, Kelly Ventura! Q: What is the story and inspiration behind your collection? I really wanted to make this collection fresh and different from anything I had seen on the market. It’s about newness, fresh and unexpected mark making, and of course, a lovely floral to tie it all together! To me, Flora is a modern story with a slightly playful twist. My hope is that is speaks to all ages, but especially the young at heart! Q: What mood or point of view have you brought into this project? This collection gives off a playful mood in my mind. Maybe a touch edgy too……the bold color and mix of abstract shapes and marks. Q: How did your collaboration with Windham Fabrics come about? A few weeks before my debut at SURTEX 2014, I received an email from Mickey Kruger of Windham Fabrics in my inbox. What? Who? Is this real?? (Those were just a few of the thoughts streaming through my head at the time!). I was so thrilled to hear that he had come across my work and wanted to chat further about a branded fabric collaboration! I met the Windham team at SURTEX, we came up with a collection, talked and tweaked patterns and the rest is history! What an amazing experience to fulfill this long time career goal of mine! I am thrilled to be continuing our relationship together……stay tuned for another collection in 2016!! Q: How has your experience been working alongside Windham Fabrics on this collection? It has been a great one! The team is awesome; friendly, knowledgable and really interested in listening to the viewpoint of the designer. With this being my first collection, I had quite a few questions and the team helped me every step of the way! Q: You’re a surface designer, how is it different designing for fabric vs. designing for another medium such as greeting cards, dishware etc.? It has definitely been a learning curve, that’s for sure. The scale of the patterns for quilting fabric is much different from what I am used to for other products……I tend to go large with my patterns, so I need to keep that in check! While I am always in tune to how pieces will coordinate within a tabletop collection, it feels quite different from designing patterns that may sit side by side on a quilt. I have a lot to learn, but love the process of exploring this new category and watching what crafters and sewists are creating with the Flora collection! Q: Can you choose your favorite print from the collection and tell us why it’s your favorite? This is a tough one, as I am torn between two prints. The floral pattern is the lead star of the group and sets the stage for the more abstract coordinates. It is playful, bold and full of small nuances, which keep the eye moving from one point to the next! The abstract mint/teal print is one that I can’t wait to make something from. A tunic or bedding are on my list for now. I love that this print is subtle in palette, but bold at the same time with its loose marks and movement. Q: What’s the one thing you can’t live without? The light in my studio. I am surrounded by windows and light streams in at every moment of the day, which makes for some pretty happy work days. Good light has made all the difference in my mood while creating, as I used to work from a dark basement space. Q: What other designers, makers or artists inspire your work? I am constantly finding new, emerging artist/designers to follow via Instagram and have made some pretty amazing connections that way. Inspiration comes in so many forms; style, design, business model, attitude, etc. and I feel very fortunate to be able to watch businesses grow and learn from these entrepreneurs. Here are a few of my current favorites: Krisit Kohut, Elizabeth Olwen, Emily Fischer of Haptic Labs, Karina Bania and Emily Jeffords. Q: Do you have a favorite quote or philosophy you live by? My Grandfather used to say, “keep on keeping on” and it sticks with me day in and day out. Q: What are you up to when you’re not designing? Spending time with my family, dreaming up ways to furnish my house, NOT weeding my over grown perennial garden and getting ready to welcome a third child into our family in August! Q: Do you have any other upcoming projects lined up for 2015-2016? Yes! After a great face to face brainstorm with the Windham team in May, another collection is in the works! I am really excited about the direction of this one, so stay tuned! Thank you so much Kelly! Be sure to check out Kelly’s site for more information about her designs! Lovely fabrics! Love the floral!